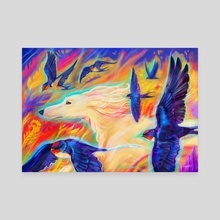 This piece was inspired by my beautiful cream Saluki who ran through a recently cut wheat field and stirred up a flight of swallows who flew along beside him as if enjoying the taste of the wind. I'm a full time artist living and working on the coast of beautiful west wales. 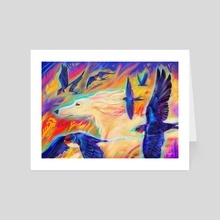 My artwork is inspired by the natural world and all the little critters you can find there if you look closely.